Crony capitalism, often manifested as using the power of government to hinder competition, is the antithesis of free-market capitalism. Crony capitalism hurts the consumer, lowers economic output, and stifles innovation and entrepreneurism. Lobbying is the primary means by which crony capitalists convince the government to protect their interests. And no industry lobbies the government like Big Pharma, as the next two charts clearly show. 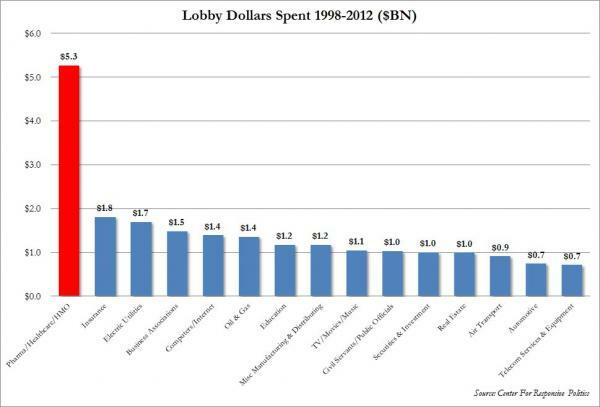 Big Pharma's lobbying dollars yield a great return: $77,500 for every dollar spent! When he first ran for president, Barack Obama campaigned against the influence of lobbyists in Washington, exclaiming in one ad in which he excoriated the top lobbyist of the drug industry, "I don't want to learn how to play the game better. I want to put an end to the game playing." Then, Obama won the White House and sought to pass an ambitious health care agenda. To do so, he made nice with some of Capitol Hill's most notorious influence peddlers. There are few industries with as much power in Washington as the pharmaceutical sector. Drug companies have spent $2.3 billion on lobbying and $183 million on campaign contributions since 1998, according to the Center for Responsive Politics. The industry also maintains a war chest for advertising and grassroots lobbying aimed at altering public opinion. The ready money serves as a strong deterrent against any legislative proposal that would lower costs for consumers and profits for the drug makers. "The industry clearly had established a war chest ... to use on advertising on health care reform," said Richard Kirsch, the national campaign manager for Health Care for America Now and the author of the forthcoming book "Fighting for Our Health." "It was very clear that ... if the administration and Congress pushed for negotiating drug prices for Medicare in health care reform, that the industry would vociferously oppose that." Fearing the drug industry would use its money and lobbyists to torpedo the entire reform package, the Obama White House made a deal to kill at least two major provisions that would have saved consumers money when they filled prescriptions. In exchange, the industry unleashed a $20 million-plus ad campaign to support the bill. Senate Finance Committee Chairman Max Baucus (D-Mont. ), a top recipient of campaign contributions from the health care industry, was put in charge of shepherding the bill to passage. But pharma's influence didn't start with the Affordable Care Act. The industry has been blocking pro-consumer drug policies for years. 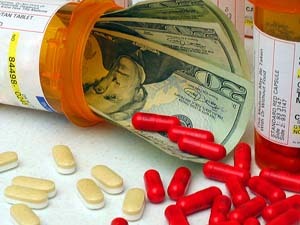 In 2003, Congress passed a prescription drug benefit for seniors known as Medicare Part D. However, thanks to industry involvement in writing the bill, the agency in charge of Medicare was barred from negotiating with drug companies to lower prices, as the Department of Veterans Affairs does. The author of that legislation was none other than Rep. Billy Tauzin (R-La. ), who barely a year later would retire from Congress and land on K Street as president of Pharmaceutical Research and Manufacturers of America -- in other words, the drug industry's top lobbyist. When the Obama White House later sought support from the drug industry for health care reform, the administration had to shelve the idea of releasing Medicare from the negotiation ban. Studies indicate that keeping drug prices high for seniors adds $150 billion to $300 billion to drug industry profits over a 10-year period. The increased costs hit the pockets of both seniors and taxpayers. In Wisconsin, some seniors get a better deal. SeniorCare, a popular state program covering 91,000 Wisconsinites that was created by then-Gov. Tommy Thompson (R), sets much lower drug prices than Medicare's prescription drug benefit. It only costs $522 on average to cover a senior through SeniorCare; it costs $1,690 on average under Medicare Part D. In 2009, SeniorCare saved seniors some $50 million. Nino Amato, president of the Coalition of Wisconsin Aging Groups, told The Huffington Post that relying on Medicare Part D alone to hold down drug prices forces seniors to "make life decision trade-offs." "Life decision trade-offs" can mean choosing between drugs or electricity or food. For millions of Americans, this is a real and growing problem. According to a 2010 Kaiser Family Foundation study, drug prescriptions rose by 39 percent while drug prices nearly doubled over the last decade. More and more individuals, hard pressed to pay for medications, are opting to abandon their prescriptions. In 2009, the number of patients who did not fill or pick up prescriptions increased by 23 percent from the previous year and 68 percent from 2006. Some Americans have tried to close the budget gap by quietly buying drugs from Canada, where government controls keep prices down. U.S. law, however, prohibits the reimportation of prescription drugs from other countries. Efforts were made to lift the ban as part of the health care overhaul -- but the drug industry didn't like that, and the Senate Democratic leadership fell in line. Despite having previously won the support of enough senators to become law, an amendment to permit prescription drug reimportation, offered by then-Sen. Byron Dorgan (D-N.D.), was defeated amid mass vote switching. After his amendment went down, Dorgan told reporters, "I believe seven days ago we had sufficient votes to pass it, but I think what is happening in the intervening period is other things developed. It's a great disappointment because it seems to me very hard to do health care reform without doing something about the escalating prices for prescription drugs." Sens. Debbie Stabenow (D-Mich.) and Olympia Snowe (R-Maine) are now trying again, co-sponsoring a bill that would legalize reimportation of drugs from certain countries. They argue that the bill would save taxpayers $19.4 billion and let millions of Americans pay drug prices that are 35 to 55 percent less. Beyond the health care deal, the pharmaceutical sector continues to fight other pro-consumer measures. During the last Congress, a provision attached to an appropriations bill would have banned "pay-for-delay," when brand-name drug makers pay off generic drug makers to keep generics off the market. The Federal Trade Commission estimates that pay-for-delay costs consumers billions of dollars annually. The provision, which barely made it out of committee, was killed during the lame-duck 2010 Congress. Four Republican senators voiced their opposition to Senate Minority Leader Mitch McConnell (R-Ky.). The appropriations bill containing the provision was shelved, and Congress passed a continuing resolution to fund the government instead. Again, those supporting a more pro-consumer policy have not given up. Sen. Charles Grassley (R-Iowa) is currently co-sponsor of a bill in Congress that would give the FTC authority to stop pay-for-delay litigation settlements. In a November 2011 press release, Grassley argued, "When people across the country are having a hard time making ends meet, this could be a real boost to their bottom line." Perhaps ordinary Americans will win the next fight over pharmaceutical policy. In the meantime, drug prices rise while the drug industry thrives, backed by its powerhouse lobbying presence in Washington.